Livonia, Michigan: ATEQ is proud to announce the new update for the ATEQ VT56 (DA1-18-11), VT55 (CA2-18-05) and VT36 (HA1-08-05). The latest technical release includes new 2016-2017 car models for OE sensor recognition and improved programmable sensor coverage as well as new functions and corrections. 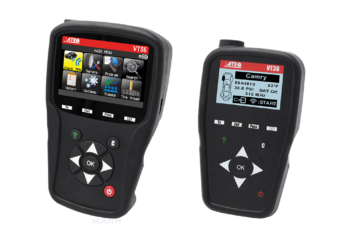 VT36: Newest update allows users to save the last vehicle data information to the tool. VT36: A new menu is available to program a sensor from Sensor Selection as well as Make, Model, Year. Major update to all aftermarket sensors coverage and reference information: Schrader EZ-sensor, Alligator Sens-it, Napa QWIK, DILL, SMP and more. Corrected relearn procedures for Mitsubishi models, reflecting ability to use Mitsureset tool to relearn the vehicle. New VIN scan coverage added for 2015 and 2016 model years, including Buick, Cadillac, Lexus, Aston Martin, GMC, KIA, Jaguar, Subaru, Nissan, Infinity. Minor text adjustments to improve legibility. VT56: Users are now prompted to select the type of programmable sensors before enabling the program functions. VT56: Settings now always display a region selected by default. All tools now display the first digit “0” in the sensor ID if available from the OE signal to support older OE sensors.